2 top hung casements, above 2 dummy fixed casements. 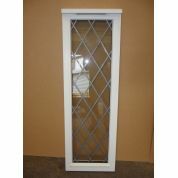 24mm clear double glazed units. Painted in grey green, but may need an extra finishing coat for cosmetics as required.